Move over Atlantic City. Cherry Hill is taking over the Monopoly board. 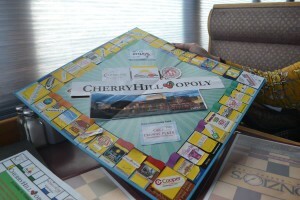 As part of a new fundraiser, the Cherry Hill Education Foundation has created Cherry Hill Opoly. It is a Monopoly-like game featuring dozens of Cherry Hill businesses. Eleanor Strofman, president of CHEF, said the idea for the board game came from a friend who saw a similar game done for Hammonton. She got a sample of the game and felt it would be great to create a Cherry Hill version. “Seeing that really started the ball rolling,” she said. To help create the game, CHEF has partnered with Cherry Hill Township and Cherry Hill Public Schools. Strofman met with Mayor Chuck Cahn to forge relationships with businesses. Strofman credited Cahn with getting a lot of businesses interested in the project. “The mayor actually started to invite the iconic businesses from around town,” she said. Each of the 48 spaces on the game board has a different Cherry Hill-based business on it. Included among the businesses are the four hospitals in Cherry Hill, multiple eateries, shops, attorney’s offices and more. Cherry Hill Mall is the presenting sponsor of the game, and Cherry Hill Dodge, Chrysler and Jeep will sponsor the trays inside the game. In place of the chance and community chest cards are history and fun cards. The history cards will involve historical fun facts about Cherry Hill. The fun cards will include activity and events taking place in the school district. Strofman hopes many families can use the game as an educational opportunity to learn more about Cherry Hill. Some spots on the board were changed to fit with the Cherry Hill theme. The go to jail space was transformed into a “drive your car to the opposite corner” space sponsored by Cherry Hill Dodge, Chrysler and Jeep. In the opposite corner is a “visit the doctor’s office” space taking the place of jail. The space is sponsored by Lourdes. Cherry Hill Opoly will also feature tokens reflecting the history of town, including a Welcome to Cherry Hill sign, a racehorse to pay homage to the former Garden State race track, a star in honor of CHEF’s largest fundraiser, Dancing with the Cherry Hill Stars, a happy face to symbolize the children of Cherry Hill, a school bus in honor of the school district, and a bicycle to symbolize the Mayor’s Wellness Program. The outside edge of the box will feature the logos of all 19 schools in the Cherry Hill district. “We wanted to make sure all 19 schools were named in some way,” Strofman said. Cherry Hill Opoly is serving as a double fundraiser in many ways. Money collected from sales of the game is going toward the foundation’s grants, and money collected for sponsor spaces on the board also goes to the foundation. The costs of the spaces range from $2,500 for a normal property to $7,500 to sponsor the history or fun card decks. As presenting sponsor, the Cherry Hill Mall paid $25,000 to CHEF. Since November 2007, the Cherry Hill Education Foundation has donated $691,018 to the school district. Strofman said money from the board game will go to next year’s grant requests. Teachers submit the requests for improvements to their classroom. “Most of them are revolved around technology,” Strofman said. Flyers for pre-orders of the game were sent home to the elementary and middle school students. Parents who attended back-to-school night at the high schools were also handed flyers. The foundation is taking orders for the game throughout the year, but set the deadline for the first round for Oct. 15. “The reason for the Oct. 15 deadline is to ensure deliveries for the December holiday season,” Strofman said. The game costs $40. Parents who send orders in to a school will have $5 of the cost donated to that school’s PTA. Strofman said the game will also be available for purchase at the Cherry Hill Public Library, with $5 of all orders placed there going to the library. Cahn said the goal is for 10,000 board games to be sold. Strofman said CHEF is reaching out to all residents, past and present, to reach that goal. For more information or to purchase Cherry Hill Opoly, visit www.cherryhilleducationfoundation.com.